The IBM Q Experience running on a tablet at IBM Research. (credit: Connie Zhou for IBM). Having identified Quantum Science and Technology as a strategic research area to be developed and reinforced, EPFL’s Institute of Physics is plunging headlong into the field with two new research openings, a master’s course, and partnering with IBM and their cutting-edge quantum-computer platform. It seems that the future will involve disruptive technologies that rely on the “spooky world” of quantum mechanics. Harnessing the properties of the quantum world, the world is preparing to usher in technologies that seem to be the stuff of science fiction, such as light-based quantum communications, unbreakable quantum cryptography, and quantum computers that run a million times faster than today’s fastest supercomputers. Europe is already heavily invested in what has come to be abbreviated as “QST” – Quantum Science and Technology, with its FET Flagship on Quantum Technologies, while Switzerland runs its own, federally funded NCCR-QSIT project. In addition to its efforts in QST research, EPFL’s teaching in QST enjoys high visibility. Dr Marc-André Dupertuis, a researcher with two IPHYS labs, has been running a Master course in quantum optics and quantum information since 2013. The course came to life through the efforts of Dupertuis and his assistant Clément Javerzac-Galy, and represents a major commitment by EPFL to establish itself as a leader in the future of QST. This view is apparently shared by IBM, an industry pioneer in the field. In 2016, the tech giant launched “the IBM Quantum Experience (QX)”, a cloud-based platform on which students and researchers can learn, research, and interact with a real quantum computer housed in an IBM Research lab through a simple Internet connection and a browser. In 2017, IBM chose EPFL alongside MIT and the University of Waterloo to be one of the first institutions in the world to use its quantum computer for teaching. Recognizing EPFL’s effort in QST teaching, IBM also marked the event with a lengthy tweet. 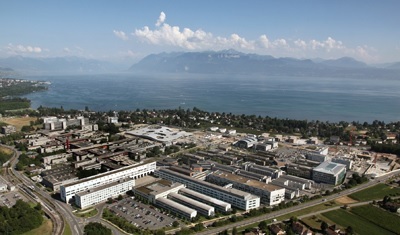 “This shows that EPFL is already a top institution in the world for what concerns teaching in this domain,” says Harald Brune. Today, the QX community spans nearly 80,000 users running 3 million quantum experiments and more than 35 third-party research publications, while users can compete for three different awards.